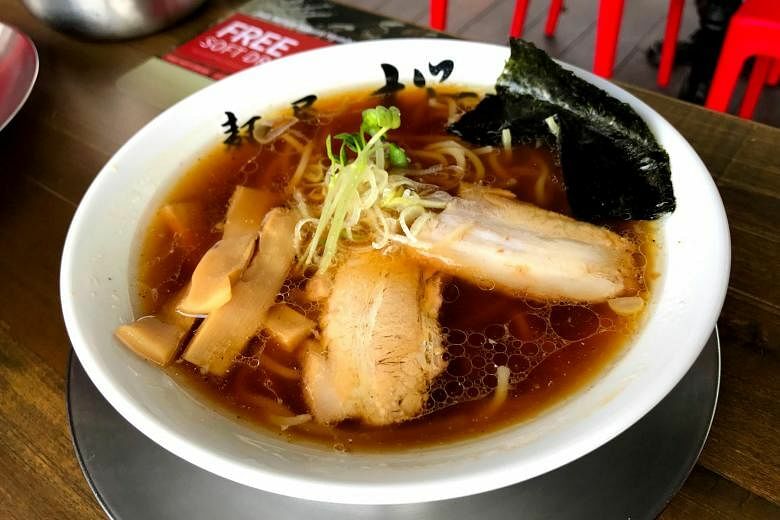 SINGAPORE (THE NEW PAPER) - Menya Sakura is one of the newest ramen restaurants to open here. You may ask “yet another?”, but it has a pedigree. It started in 2010 as a nine-seater in Showa-ku, Nagoya, and grew into a chain of 15 ramen restaurants in Japan and seven in Indonesia. The outlet in Boat Quay is the first in Singapore. Open: 11.30am to 10.30pm (Monday to Saturday), closed on Sundays. The dashing Sho Naganuma — former executive chef at Hide Yamamoto — returns to Singapore to helm this outlet. If you find him familiar, you may have seen the Nagoya-born chef hosting his own travel shows on the Asian Food Channel. Menya Sakura specialises in Nagoya-style ramen, which is characterised by hearty soups brewed from meats and seafood. An example is the Chuka Soba ($10.90, below). It is the Japanese version of the Chinese egg noodles, which Chef Naganuma said is difficult to find in Singapore or even Tokyo. The light broth, made from chicken and fish dashi, is best described as clean and simple. Some may find it salty, but I enjoyed it tremendously. The Tonkotsu Tsukemen ($14.90, below) turned out to be the popular choice at the restaurant. 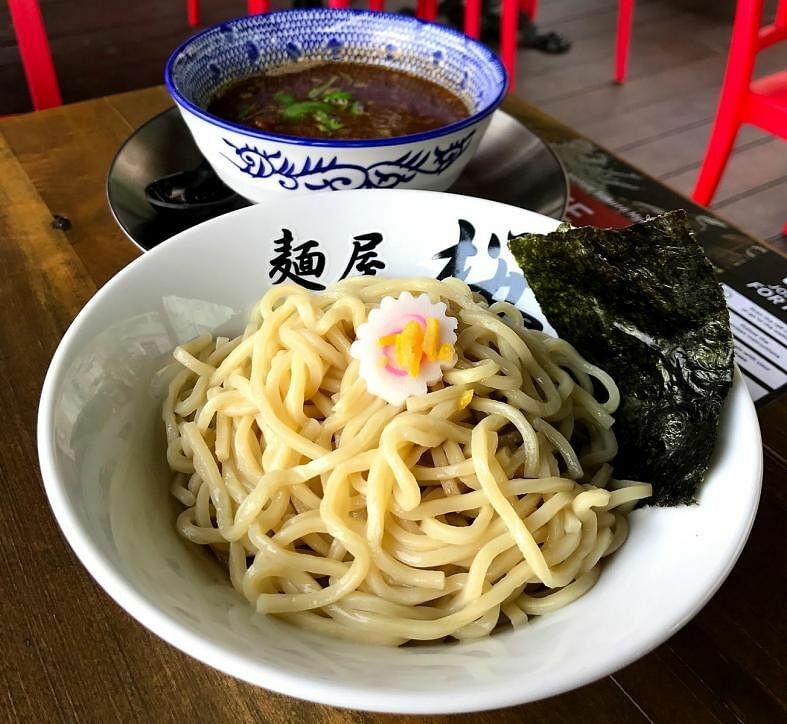 The cold thick noodles are dipped into a warm and full-bodied dipping soup made from pork bones and seafood. I tasted more seafood than pork in the dip, but the intensity of it did not overwhelm the sturdy noodles. This is a good choice if you are ravenous. Menya Sakura has a selection of side dishes to go with its alcohol, but a lot of the side dishes are good on their own. 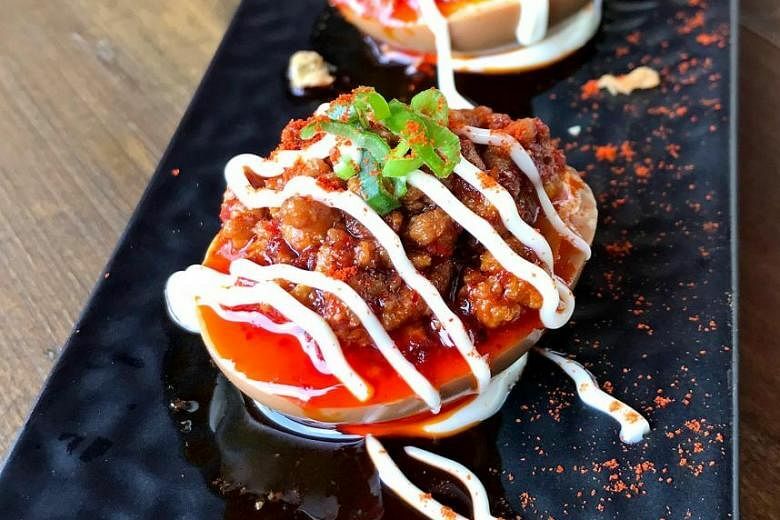 My favourite is the one-bite Ajitama Devil Egg ($4.90, below). It is as tasty as it is pretty, and it is simple — just a halved hard boiled egg with an aromatic paste over it. The paste is more spicy than it looks though, so manage your fiery expectations. Also delicious is the Truffle Egg Rice ($6.90, below). 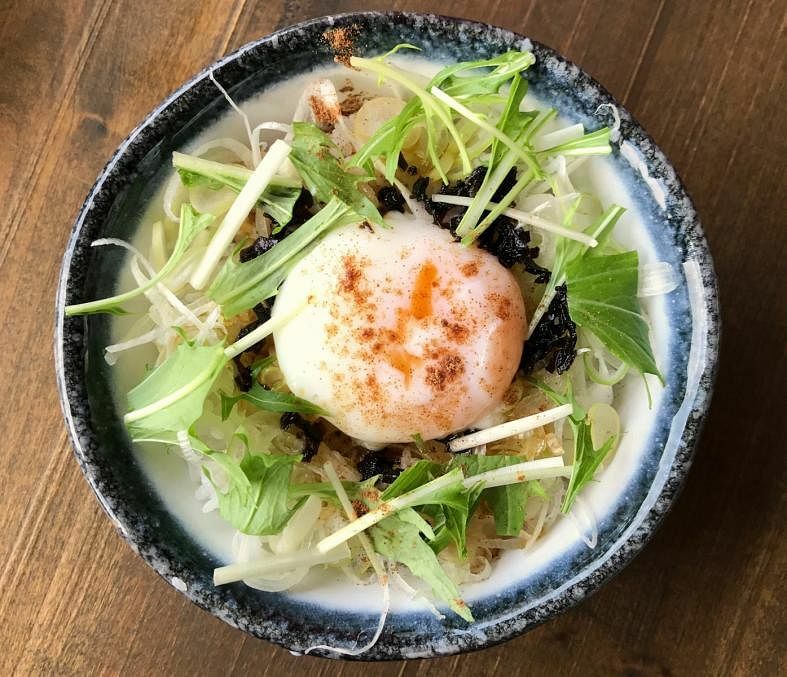 The egg and truffle combination is hardly new but it is a winning one. The success is repeated here. I have a weakness for chives, so it is hardly a surprise that I responded favourably to the Minced Pork with Moyashi Sprout ($6.90). It also comes with scallions, seaweed and bonito powder. Just mix them up and you are good to go.